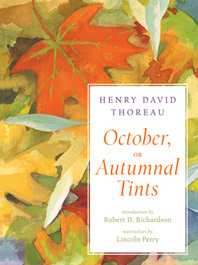 October, or Autumnal Tints - Description | W. W. Norton & Company Ltd.
“A gorgeous edition” (Boston Globe) of Thoreau’s classic work, enhanced with an illuminating essay and beautiful watercolors. Thoreau’s astute meditations are framed by a biographical essay by acclaimed scholar Robert D. Richardson that delves into the events and relationships influencing Thoreau’s philosophy. Sensuous watercolors by Lincoln Perry bring to life the fall colors described so ecstatically by Thoreau, allowing longtime Thoreau fans and leaf-peepers alike to feel as though they are walking among the falling leaves alongside one of our best observers of the natural world.